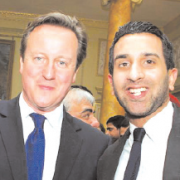 British Premier David Cameron paid a glowing tribute to British Sikhs for their remarkable contribution to multicultural Britain at a presti- gious reception at 10 Downing Street earlier this month. 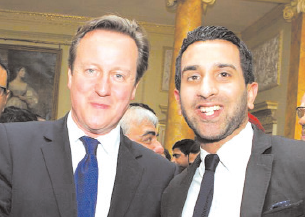 Over 100 guests, men and women, and each a leader in their own right, attended the fourth annual Vaisakhi reception host- ed by Mr Cameron.Regardless of motive or objective, credit must be given to the PM, or to Dave, as some call him, for recognising and acknowledging the contributions of main- stream community groups which make up the mosaic of multi-cultural Britain. A key announcement that Mr Cameron made at this event was that, as of Monday 7 April, Sikhs in the UK would be exempt from wearing hard hats at construction sites. “From now on Sikhs don’t have to wear hard hats at construction sites in our country,” he said. “We have already stopped searching of turbans in the UK,” he added, describing British Sikhs as “absolute role models in integrating with the British society.” Construction sites are considered to be one of the most dangerous workplaces and hard hats are worn as a precautionary measure. Here, guests from all over the country exchanged hugs, handshakes and business cards. Vegetarian canapés and soft drinks were served by catering staff.Then came the moment everyone was waiting for: Mr Cameron entered the room. As always, it was amusing to see several guests cut short their conversations with whoever they were chatting to and head towards the PM, in a desperate attempt to meet him. For those meeting the PM for the first time, understood. But you’d think the regulars would give others a chance. Eventually, the PM arrived at the raised platform and gave his address:”I send my best wishes to everyone in Britain and around the world celebrating Vaisakhi,” he began. “This year marks 160 years since the first Sikh arrived in Britain. Since then, the story of British Sikhs has been one of success – of many thousands of people making a positive contribution in so many ways. From the Sikh entrepreneurs and small businesses who are creating jobs, to the business leaders who are helping to boost overseas trade; from the hard working families who are getting on in life, to the sports- men and women who do our country proud, Sikhs are a key part of our island story. In Britain, another aspect of Sikhs’ contribution stands out: “Seva”, or selfless service. We see it across the country – Gurdwaras which prepare meals (langar) for their com- munities; Free Schools giving children the best opportunities, charities helping their commu- nities, like those who went to help residents hit by the recent flooding. As we celebrate the Sikhs contribution to Britain today, let’s also be reflect on what their ancestors did for this nation in the past. A hundred years ago, well over a million men from India, many of them Sikhs, fought alongside Britain in the First World War. A beautiful hymn in Punjabi was sung by 17-year-old stu- dent Gurpreet Singh Chandan, of the Amrit Singh Jatha group, part of the Birmingham-based Guru Nanak NishkamSewakJatha, or GNNSJ. As a mark of respect guests were asked to remove their shoes and to cover their heads. Those able to sit cross-legged on the floor did so, while others chose to stand, as did the PM, clean shaven and wearing a navy blue suit. One guest asked why such events were not covered in mainstream British press. An interesting and valid point raised. So in the grand scheme of things, does this mean events like these are of little or no significance for the British mainstream media? According to a report, 96% of British Sikhs would like to see more Sikhs on mainstream British TV, includ- ing in documentaries, sports- based features and in fictional dramas. The youngest guest in the audience was NihalHari Singh, son of former Leicester Lib Dem MP Parmjit Singh Gill. Nihal, dressed in a traditional Indian outfit, who turned eight last Sunday, asked Mr Cameron, “is it hard work being Prime Minister?” Mr Cameron shook Nihal’s hand, smiled and replied: “Fortunately I have a lot of people to help me.” India’s High Commissioner to the UK Ranjan Mathai,lead- ing non-resident Indian indus- trialist Lord Swaraj Paul, Lord NavnitDholakia, deputy leader of the Liberal Democrats in the House of Lords and Dr Rami Ranger, winner of record five Queens’ awards for exports were among those who attend- ed this function. Present from the ethnic media were: Manoj Kumar, Editor-in-Chief of Jagatwani, the newspaper,VasudevTuli from Zee Punjabi, PoonamTaneja from BBC Asian Network. Others in attendance were former Deputy Lieutenant of Leicestershire Resham Singh Sandhu, former Leicester MP Parmjit Singh Gill, Chairman of National Asian Business Association UdayDholakia OBE,Shalbinder Singh Malle,Rt Hon Hugo Swire MP, KetanGokani from Elite Mobile Limited, Amanda Solloway, Conservative Parliamentary Candidate for Derby North, Sukhbir Singh from GNNSJ, Ranbir Singh Suri from the now defunct British Asian Conservative Link, Mr Bhupinder Singh, MD, PNBIL,Mr.VivekChadda Director SNJ Group, Tommy Nagra, BBC Birmingham’s Head of Business Development, Jas Jassal, MayuriParmar and Alok Sharma MP, from Conservative Friends of India,Mr.JindyKhera M.D. KTC, Mr. Jayson Woura M.D. East End, Sir Mota Singh, Mr.Atul PathakMD Appt Corp Ltd., Priti Patel MP, Mr & Mrs Jas Parmar from Bedfordshire, Chris White MP,Mr.Sohi Singh, Sukhdev Singh SiddhuMinnister of Co-ordination (India House), Ashok Verma from Leicester, Satinder Singh from Gurseva, Minister for Communities Stephen Williams MP, Lord DaljitRana, Paul Uppal MP, Sun Kaur of United Sikhs – to list just a few. According to the 2011 Census, there are approximate- ly 430,000 Sikhs in the UK, with the vast majority (420,196) in England. Worldwide the Sikh population stands at around 27 million. The first Sikh settler in Britain was Maharaja Duleep SinghJi (1838-1893). Vaisakhi, the annual Sikh harvest festival, was first cele- brated in the Punjab region of India and commemorates the founding of the Sikh faith in 1699.